Acrylic key holder featuring original illustration by Yu-pon. 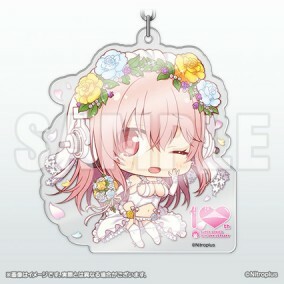 To commemorate the 10 years since Super Sonico's debut, "chimi" illustration master Yu-pon created the cute little Sonico in her wedding dress featured on this key chain! Make her yours and treasure her for all time. First sold at Wonder Festival Summer 2017.